1. Gently heat the sugar in a saucepan with 400ml water until it has dissolved. Add the cranberries, increase the heat to medium-high and bubble for 5-10 minutes, until the cranberry skins start to pop open. 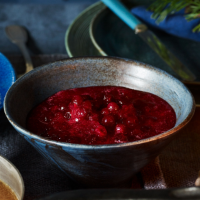 Reduce the heat and simmer gently for a further 10-15 minutes, stirring every now and then, until the cranberries are tender and the sauce has thickened. Leave to cool before serving. This recipe was first published in Fri Dec 01 16:23:46 GMT 2017.